Day and Father's Day they were actually offering 25% off but I just didn't get around to ordering because I couldn't make up my mind which one I wanted. SO, if you you are looking for some running visors, go check them out! This isn't a plug for HeadSweat, I promise! I just really like their visors! Oh, and I found a great deal on my Wave Rider 18's last night so I picked these up. I know, nothing new on race day, but because I've been in this style for a while now and these fit like a glove, I might just wear them for the race tomorrow. 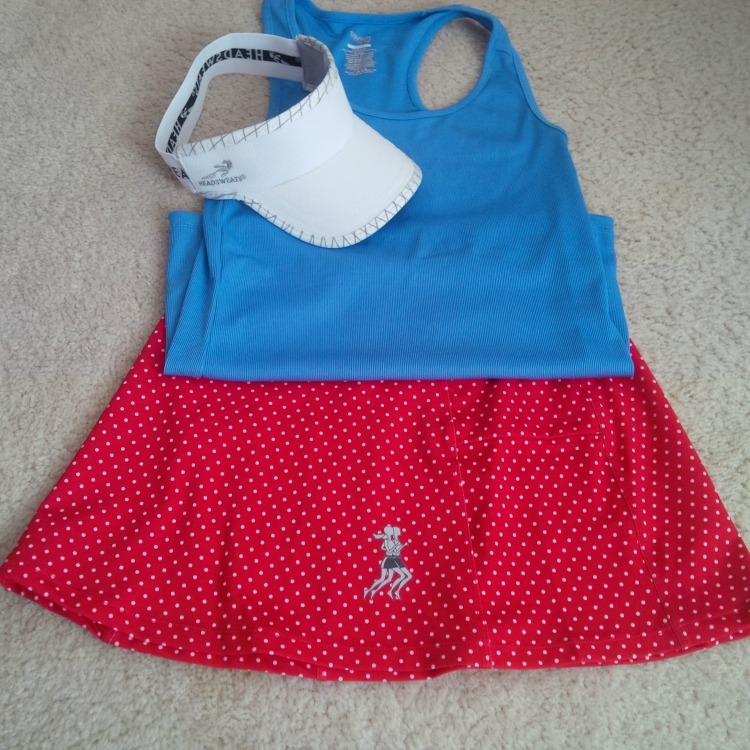 Besides, don't you think the red shoes will look great with my patriotic race day outfit? So, back to the race. I signed up for several 5Ks this summer in the hopes of working on my speed. Well ( insert laugh here), I should have known that the middle of summer is certainly not the time to be working on speed. I was certainly pleased with last month's 5K seeing as I did not train and I was still able to keep my sub 30 streak alive. However, I actually DID do more training runs for this 4th of July race but to say they were pretty "crappy" runs is an understatement. Every run I did was very hot (even when running in the morning) and the last two runs I did my left calf and ankle have been feeling very tight. (It's always something isn't it?) I took off running on Sunday just to rest it a bit, so I am hoping that helps. From what I hear, this is a pretty large race and there are a lot of activities associated with it so I am sure it will be a good time regardless. This may be one that I do just for the camaraderie and festivities! Sounds like you have a busy but fun day ahead. Good luck with the 5k! Thanks Kathryn! I hope you are having a great time with your family this weekend! Have a great time at your race!! Super cute outfit. 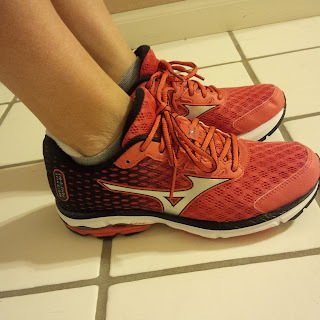 I would totally wear a new pair of my wave riders on race day. I love the feel of a brand new pair of shoes!!! I wore them an they were great! I almost bought that skirt for my race! You are going to do great! good luck and have fun! I bought the skirt originally for a Disney race but am glad to have gotten more use out of it! It was perfect for a July 4th race! Hope you had a great race this morning! Yep - I have dogs that are scared to death of the fireworks. They're also scared of thunder & I know that's what they think it is. So I pulled them into the bedroom & cranked up the TV to try & tone it out for them. The things you do for your dog. Yup that's what we try to do too. Funny that the fireworks never bothered our Weimaraner. Love the outfit! I've worn new Mizunos on race day with no regrets -- even when they were a slightly different style. My feet are just used to the basic shape I think. I hope your 5K went well. Yup, no regrets here. They worked like a charm! good luck today and it sounds like you got some great deals on running gear! Yes, i'm very please with what I got! I think i'll get a lot of use out of that visor! Very cute outfit for the 4th!! Next year I'm going to be better prepared and actually put together something cute and festive for the holiday. I hate that people set off fireworks in neighborhoods. Besides the risk factor, SO many animals are terrified of them. Many dogs and cats run away from home on the 4th because they're scared of the noises! I wish people would leave fireworks to the professionals so neighborhoods could stay quiet and safe. Hope you enjoyed your race. Cute outfit too. I never worry about wearing new shoes if it is the same model and brand I have been wearing. Super cute skirt- I hope you enjoyed your run! And nice shoes- I have a new pair waiting for me at home and I'm so excited! My dog used to hide in the bath tub for all storms and fireworks, I hated to see her afraid. so I was feeling a little speedier in the spring and then boom humidity so much for the speedier 5k's for me too! Very festive outfit! I hope you had a great Race! Can't wait for the recap! I hope you had a great 5k. I'm with you: I sign up for 5ks to work on my speed, but forget that summer runs are really hard. haha My dog (a small chihuahua) is somehow immune to fireworks and storms. He doesn't really care about either. He'll bark for a few seconds then go lay down. Cute outfit! I ran a July 4th 5K! FUN! Our lab did not much carry for fireworks either.